Though the common belief is that the Rays wouldn’t make an expensive splash to add Craig Kimbrel, Marc Topkin of the Tampa Bay Times tweets that there’s somewhat of a “never say never” sentiment within the organization as Kimbrel continues to linger (and as his price likely drops in corresponding fashion). The right-hander doesn’t appear likely to cash in on the mega contract he sought early in the offseason, and it’s not clear at this point how many clubs would even have interest on a multi-year pact. I ran through some potential landing spots for Kimbrel on shorter-term deals (with a significant annual value) last Friday and largely glossed over the Rays due to their historic reluctance to spend at that level and due to the fact that Kimbrel would require forfeiture of a draft pick (another prior sticking point for Tampa Bay). However, with a projected Opening Day payroll of just $60MM and only $27MM on the books in 2020 (per Roster Resource’s Jason Martinez), the Rays certainly have the payroll space to add Kimbrel if they look to break character for a second time this winter after already inking Charlie Morton (two years, $30MM). The Rays opened the 2018 season with a $76MM payroll. The Orioles would trade any of their starters who are “making significant money,” Ken Rosenthal of The Athletic writes in his latest notes column (subscription required). It’s hardly surprising that Baltimore would jump at the opportunity to shed the remaining $43MM (over three years) on Alex Cobb’s contract or the $8MM owed to Andrew Cashner this season, but Rosenthal also lists right-hander Dylan Bundy (earning $2.8MM) among the group. Moving Bundy would be more surprising given his affordable salary and remaining three seasons of control, though it seems unlikely they’d sell low on the former No. 4 overall pick after he led the Majors with 41 homers allowed last season. Bundy, 26, has demonstrated very appealing K/BB numbers over the past two seasons, but home runs have continually been a problem for him at the MLB level. A trade of any of the three seems extraordinarily unlikely to happen before Opening Day, but if any of that trio is performing well early in the year, he’ll emerge as a trade candidate this summer. Red Sox right-hander Brandon Workman opened Spring Training with a fastball that was sitting 92 to 93 mph, writes Jason Mastrodonato of the Boston Herald, but his velocity has dipped substantially in recent outings. Workman has averaged 87 to 89 mph on his fastball in his past two outings, and manager Alex Cora spoke to Mastrodonato about the current “dead arm” Workman is attempting to overcome. As Mastrodonato points out, the majority of Boston’s candidates for the bullpen have struggled this spring, which at least has the potential to open the door for a prospect like Darwinzon Hernandez to get a look. Orioles starting pitchers Alex Cobb and Andrew Cashner have both reportedly cleared revocable trade waivers, per Jon Heyman of Fancred Sports. They’re now eligible to be traded to any team for the remainder of the season. It should be noted that a trade of either pitcher doesn’t seem particularly likely. Cashner, for his part, owns a 4.84 ERA on the season, and his 4.95 FIP suggests that bad luck has taken no part in that performance. He’s owed another $8MM beyond this season, and at the age of 31 it seems more likely than not that his performance could continue to decline. In addition to his rough surface numbers, Cashner’s skill set leaves plenty to be desired. He’s only managed to strike out 6.25 batters per nine innings while walking almost four. Meanwhile, his 42.4% ground ball rate this season would be a career-low by far. On the other hand, Cashner’s only a year removed from a performance that made him a league-average pitcher by fWAR. In 28 starts, the right-hander managed to post a 3.40 ERA. While peripheral statistics considered that output to be incredibly lucky (on the extreme end, xFIP estimated him to have performed at the quality of a 5.30 ERA hurler), it convinced the Orioles to hand him a two-year pact, and that small glimmer of promise could convince a pitching-desperate contender to bring him into the fold. The $10MM or so left on his contract isn’t cheap, but it’s not a franchise-altering sum, either. Cobb has seemingly turned his season around after an abominable first-half showing. The right-hander has now posted six consecutive quality starts dating back to July 26th, and owns an elite 2.16 ERA since the All-Star Break. Owing in part to a resurgence in the effectiveness of his wicked change-up, Cobb has been a nightmare for opposing hitters of late, and the $46MM owed to him beyond 2018 is certainly a significant deterrent to any potential trade partner, Cobb would seemingly be an upgrade to the rotations of many contending ballclubs. For their part, the Orioles would almost certainly be happy to unload most of Cobb’s remaining contract as they enter what looks to be a lengthy rebuilding process. The Dodgers announced that they’ve placed right-hander Walker Buehler on the 10-day disabled list with a microfracture in his right rib and recalled left-hander Caleb Ferguson from Triple-A. Pedro Moura of The Athletic tweets that Buehler made three starts with the fracture before being forced to the DL and is playing catch today. Moura adds that the Dodgers are hopeful that it’ll be a matter of a couple weeks as opposed to an extended absence. There’s good news for the Dodgers, however, as Buehler’s spot will be filled by an established face. Manager Dave Roberts revealed to reporters Tuesday night that Kenta Maeda will be activated from the DL to start on Wednesday (Twitter link via the OC Register’s Bill Plunkett). While he’ll be limited in terms of pitch count and innings, the return of Maeda serves as a welcome breath of fresh air for a Dodgers pitching staff that has been utterly hammered by injuries of late. Even with Maeda’s return, Buehler will join Clayton Kershaw, Rich Hill, Hyun-Jin Ryu, Julio Urias and Dennis Santana on the DL. Orioles righty Andrew Cashner landed on the 10-day disabled list due to a lower back strain, per a club announcement. Left-hander Donnie Hart is up from Triple-A Norfolk to take his roster spot for now. Cashner, 31, signed a two-year deal worth $16MM this offseason but has struggled through his first 13 starts in Baltimore. The well-traveled righty has a 4.98 ERA with 7.7 K/9 against 4.2 BB/9 and a 38.9 percent ground-ball rate in 72 1/3 innings. While Cashner’s strikeout rate is up noticeably from 2017, he’s also seen his walk rate rise substantially and has also been plagued by a 1.62 HR/9 mark. Dylan Bundy, Kevin Gausman, Alex Cobb and David Hess remain active in the Baltimore rotation, and there’s been no announcement as to who’ll start tomorrow in Cashner’s place. The Tigers announced that Miguel Cabrera left tonight’s game against the Twins with a biceps tendon strain. He’s undergoing an MRI to evaluate the extent of the damage, per the announcement. The 35-year-old Cabrera has had a bounceback season at the plate in terms of his average and on-base percentage, but he’s hit just three homers in 155 plate appearances and hasn’t shown much power. Cabrera is hitting .301/.394/.451 on the season overall and has already missed nearly a month of the season due to a strained hamstring. Chris Archer has had a minor setback in his rehab from an abdominal strain, writes Marc Topkin of the Tampa Bay Times. Rays manager Kevin Cash stated Tuesday that Archer woke up feeling “not that great” and added that the team is taking a more “conservative” approach in light of the news. Archer clarified to Topkin (Twitter links) that he hasn’t had a major setback but some post-bullpen soreness that could slow him for a few days. Topkin notes that that could be enough to push Archer into a minor league rehab assignment, which would delay his return to the Tampa Bay staff. After a terrible start to the season, Archer has turned in a 2.47 ERA with a 40-to-15 K/BB ratio in 43 2/3 innings across his past seven appearances. Athletics righty Trevor Cahill hasn’t seen any improvement in his ailing Achilles tendon and is likely headed to the disabled list, manager Bob Melvin told reporters Tuesday afternoon (Twitter links via Jane Lee of MLB.com). If that likely outcome does come to pass, then right-hander Chris Bassitt will “certainly be the first option” to step into Cahill’s spot in the rotation, the skipper adds. Cahill, who signed a one-year deal worth $1.75MM late in Spring Training after Jharel Cotton went down with Tommy John surgery, has been excellent when healthy enough to take the hill for the A’s. In 48 2/3 innings, he’s notched a 2.77 ERA with 47 punchouts against 11 walks. The Rays are preparing to give a long look at outfielder Mallex Smith, as Marc Topkin of the Tampa Bay Times writes. As he nears his 25th birthday, Smith has upped his offensive game, with a .373/.418/.510 batting line. Though he’s carrying an unsustainable .432 BABIP, it’s notable that Smith has been striking out at a meager 12.5% clip. With Kevin Kiermaier just starting a lengthy DL stint, there’s little reason not to see whether Smith can stake a claim to an everyday job. Topkin also covers some of the other players who could see additional opportunities due to the loss of Kiermaier. Red Sox president of baseball operations Dave Dombrowski gave an honest answer when asked by Jason Mastrodonato of the Boston Herald whether he foresaw the team’s unbelievable start to the season. “We thought the capabilities were there,” said Dombrowski. “But for me to say we expected it to this point, that would be a bit much.” Still, he did acknowledge that he and the rest of the front office truly believed that last year’s tepid run production would turn around, with or without the addition of J.D. Martinez. Sox fans will want to read the entire piece, which gives an interesting look at all the things going right in Boston at the moment. The story isn’t quite the same in Baltimore, where the Orioles are off to a miserable opening run. One bright spot has been Andrew Cashner, one of several offseason pitching additions. Jon Meoli of the Baltimore Sun examines whether his 3.00 ERA through 24 innings — which follows a 3.40 mark in 166 2/3 frames last year — could be sustainable despite still-middling peripherals. Skipper Buck Showalter seems to believe that Cashner has matured as a pitcher and “came into his own last year.” He says he’s “hoping that we’re going to reap the benefits of that” over the full course of the current season. Of course, as Meoli explains, there are certainly some reasons not to buy in. Relief pitching was expected to be an overwhelming strength for the Yankees in 2018, but Marc Carig of The Athletic writes (subscription link) that there are some cracks in the pen. Beyond just short-term struggles with results, the Yanks have seen cause for deeper concern with some pitchers. In particular, Dellin Betances has shown a bit of a velo drop and, perhaps more worryingly, reduced spin rate. There are similar issues for Tommy Kahnle, who is now on the DL after not looking capable of sustaining his 2017 breakout in the early going. The Blue Jays have received generally promising news on star third baseman Josh Donaldson, as Shi Davidi of Sportsnet.ca tweets. Skipper John Gibbons says that, though Donaldson isn’t going to be ready to come back after the minimum ten-day stint, he has resumed throwing and is feeling “great.” The real question, though, is whether Donaldson will be able to throw without limitation after showing reduced form early in the season. Andrew Miller’s four-year, $36MM deal with the Yankees from the 2014-15 offseason has become one of the most influential contracts in recent baseball history, the New York Post’s Joel Sherman opines. Miller’s contract set a new standard for non-closer relievers, and its value has only grown in import thanks to the Indians’ usage of Miller as a multi-inning fireman. As teams have put a focus on deep and flexible bullpens, relievers have been increasingly well-compensated in free agency; even during this unusually slow offseason, several relief arms have scored hefty multi-year commitments. The fact that many notable relievers out-earned several notable sluggers and starting pitchers this winter is of no small concern to Miller, who is also a Players Association Representative. “We have to understand the economics of how this works. If one position or one skill is valued more highly, you probably will have another skill valued not as highly,” Miller noted. Andrew Cashner wouldn’t have signed his two-year, $16MM deal with the Orioles unless he was allowed to keep his beard, Jon Meoli of the Baltimore Sun reports. The O’s usually have a ban on facial hair (besides “a well-manicured goatee”) but an exemption was made for Cashner, provided that he keeps his beard neatly trimmed. “I just think it’s a part of who I am, and it’s a part of my personality — it’s just me. I think this length is kind of what it’s supposed to be, I guess,” Cashner said, who noted that he disliked having to shave his beard when he played for the Marlins, another club with a facial hair ban. The Cubs are probably done their major offseason shopping, The Athletic’s Patrick Mooney writes (subscription required), as the team is likely to save its remaining money for potential in-season additions. By Mooney’s calculations, Chicago has roughly $13MM left for the trade deadline without going over the $197MM luxury tax threshold. Orioles infielder Manny Machado “wants to be a Yankee and the feeling is mutual,” Bob Nightengale of USA Today writes. The Yankees were among the teams that tried to trade for Machado over the winter, so it’s no surprise that they’re continuing to eye him a year before he hits free agency. Regarding offseason trade rumors, Machado said, “Thank God nothing went down and I was able to come back, and see my guys that I’ve been with for seven years.” Although the 25-year-old is content to be an Oriole for now, it seems highly unlikely he’ll remain with them past this year, considering the massive contract he’d land on the open market. And while the longtime third baseman plans to spend the rest of his career at shortstop, where New York has a quality starter in Didi Gregorius, the Yankees would find spots for both of them, Nightengale suggests. The Indians announced Friday that right-hander Danny Salazar “experienced an onset of right shoulder rotator cuff inflammation” last month during his offseason throwing program. The 28-year-old is “a couple weeks” behind the rest of the pitchers in Indians camp, per the announcement, though he has at least resumed throwing. It certainly doesn’t appear as if Salazar is presently dealing with a major injury, but the shoulder trouble isn’t entirely insignificant. Salazar missed roughly six weeks of the 2017 season due to shoulder troubles, and he has a history of right elbow issues as well. He’s also seen his name pop up in occasional trade speculation, most frequently being linked to the Brewers, though one would imagine that ongoing shoulder issues would temper some of the interest that other clubs may have in Salazar.There’s not yet any indication that Opening Day would be in jeopardy for Salazar, whom the Indians have penciled into a rotation spot alongside Corey Kluber, Carlos Carrasco and Trevor Bauer. Josh Tomlin and Mike Clevinger are both on hand as options for the fifth spot. Injuries limited Salazar to just 103 innings last season, during which time he posted a 4.28 ERA with a gaudy 12.7 K/9 mark against 3.8 BB/9. Before he joined the Phillies on a three-year, $60MM contract in November, longtime Indians first baseman Carlos Santana proposed a five-year, $75MM deal to Cleveland, the player told Anthony Castrovince of MLB.com. However, “the Tribe was never seriously engaged with him at all this winter,” Castrovince tweets. Shortly after Santana left the Indians, they added replacement Yonder Alonso on a much cheaper pact (two years, $16MM). 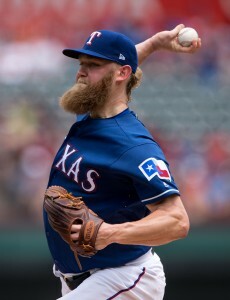 Texas had interest in re-signing Andrew Cashner before he accepted Baltimore’s two-year, $16MM guarantee Thursday, Rangers general manager Jon Daniels confirmed to TR Sullivan of MLB.com. 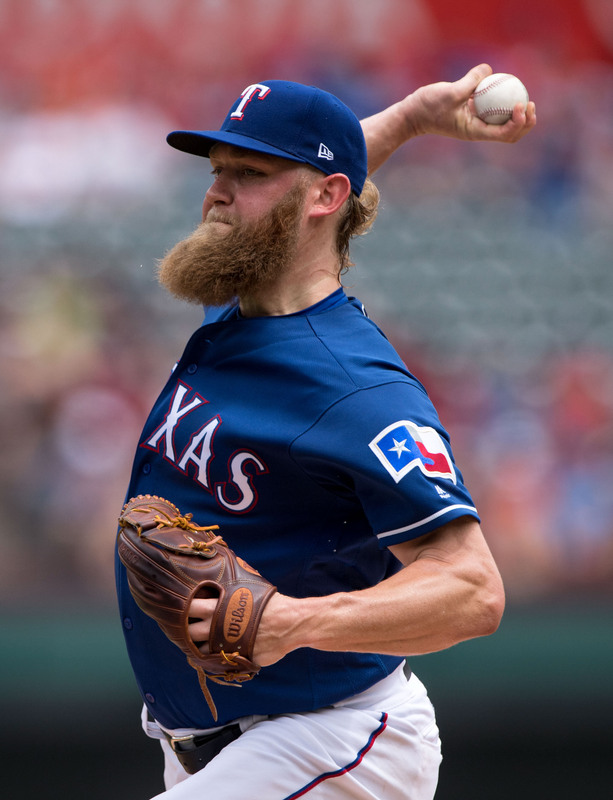 However, not only did the Orioles make Cashner a better offer, but it seems he wouldn’t have been a lock to remain a starter with the Rangers. “We talked to him and gave him a range of what we were thinking,” Daniels said. “He got a better deal. We even asked him if he would pitch in the bullpen, but he got a commitment to start, a multi-year deal, a good deal from Baltimore.” In 2017, his only year with the Rangers, Cashner paced their starters in ERA (3.40) and finished second in innings (166 2/3), though his success came in spite of a league-worst K/BB ratio (1.34). The Orioles have announced an agreement with free-agent righty Andrew Cashner. It’s a two-year, $16MM contract, reports Roch Kubatko of MASNsports.com (via Twitter). Cashner is represented by CAA Sports. Cashner will receive consecutive salaries of $5MM and $8MM, Kubatko reports (Twitter links). The remaining $3MM is a signing bonus that will be deferred to 2020 through 2022, according to Kubatko and Jon Heyman of Fan Rag (Twitter link). There’s also a $10MM vesting option on the contract, in addition to $5MM available in yearly incentives, reports SB Nation’s Chris Cotillo (links to Twitter). The option becomes guaranteed if Cashner throws 340 innings over the first two seasons of the deal. It’d become a $10MM player option for Cashner in the event that he reached 360 total innings from 2018-19. Cashner has topped 170 innings in a season only twice, making those fairly lofty goals for a pitcher with his lack of durability. He’d need replicate his career-best 2015 workload (184 2/3 innings) in consecutive years to obtain the player option. Cashner, 31, will give the Orioles some desperately needed depth for their rotation, as the only locks for starting jobs until this pickup were righties Kevin Gausman and Dylan Bundy. He’s made at least 27 starts in each of the past three seasons and is coming off a 3.40 ERA through 166 2/3 innings with the Rangers, albeit with less-impressive marks of 4.6 K/9 against 3.5 BB/9. Cashner averaged 7.9 strikeouts per nine innings pitched in 2015-16 with the Padres and Marlins, but he somewhat bizarrely saw that number plummet upon signing on with the Rangers. The right-hander did significantly decrease the usage of his four-seam fastball in favor of cutter/sinker, so it’s possible that his pitch selection in 2017 played a large role in his decline in strikeouts. Cashner’s fastball velocity, after all, continued to average better than 93 mph. Still, his 6.1 percent swinging-strike rate and 4.6 K/9 mark were among the bottom two marks among all qualified starters. Whatever the reasons behind it, the sudden lack of missed bats has to be considered somewhat of a red flag, especially moving into an AL East division that is stacked with some fairly potent lineups. Cashner should give the Orioles a more steadier option to occupy the third slot in the rotation than virtually any of the team’s internal candidates, though he currently profiles more as a back-of-the-rotation arm than mid-rotation starter. The O’s have reportedly been striving to add three starters this winter, including one lefty, so it’s quite possible that Cashner is the first of multiple additions for Baltimore in the weeks to come as Spring Training progresses. It’s been a rather bleak scene for all free agents outside of the relief market thus far in the offseason, but while Cashner surely waited longer than he’d have hoped to land a deal, his $16MM guarantee falls pretty well within the parameters of reasonable expectations. Heading into the offseason, MLBTR listed Cashner 27th among free agents in terms of earning capacity and pegged him for a two-year, $20MM pact. The Blue Jays are showing “continued interest” in free-agent righty Andrew Cashner, tweets MLB.com’s Jon Morosi, though he’s one of several starters they’re eyeing. The Jays have a need for a fifth starter to round out their rotation, and Morosi suggests that they’re hoping to fill that vacancy on a one-year deal. It’s not a surprise to see the Jays (or any team, for that matter) preferring a one-year term on the free-agent market, but Cashner reportedly entered the offseason in hopes of securing a three-year pact. It’s possible that the crawling pace of the offseason has lessened his demands to an extent, but there’s been no indication that Cashner is willing to jump on a one-year offer to date. The 31-year-old made 28 starts for the Rangers last season and posted a 3.40 ERA, albeit one that looks to be largely smoke and mirrors. Cashner’s 4.64 K/9 rate was the second-lowest in the Majors, and his 3.46 BB/9 rate was worse than the league average. Overall, his K%-BB% of just 3.1 percent was the worst of any qualified pitcher in baseball, leading fielding-independent metrics like xFIP (5.30) and SIERA (5.52) to paint an unflattering picture of his work. The said, Cashner’s fastball averaged better than 93 mph, his 48.6 percent ground-ball rate was comfortably above the league average, and he demonstrated the home-run suppression skills he’s shown for much of his career despite a move to a hitter-friendly setting in Arlington (0.81 HR/9). Cashner did rely less on his four-seam fastball with the Ranges than he ever has in previous seasons, instead favoring more cutters/sinkers. Some clubs may believe that altering that pitch selection a bit could restore some his strikeout prowess. The Blue Jays currently project to have Aaron Sanchez, Marcus Stroman, J.A. Happ and Marco Estrada in the top four spots of their rotation. Joe Biagini was their most frequent fifth starter in 2017, though he struggled in a move to the rotation after enjoying success as a reliever in his 2016 rookie season, when he was a Rule 5 pick. Prospect Ryan Borucki is close to big league ready and could conceivably step into the mix, though it stands to reason that the Jays would prefer to ease him into a big league job rather than throw him directly into the fire in the season’s first couple of weeks (without much of a veteran fallback option in place, should he struggle).